Jane Sharp - Writer - Poet - Musician : Sheds Away! I know he (Cyrus the Shed) is looking a bit naked at the moment, but it won't be long before he is labelled, and decorated with a few obligatory 'shed' accessories. For now the pink blossom frames him nicely. And look how happy my man is. Not so, I, who have just roasted a ham joint forgetting all about soaking it overnight to de-salt it. Yuk! Another cooking failure. We'll have to eat it a little at a time. Well, is someone telling me something? I've managed to write a couple of poems this week, one about the Industrial Revolution, I don't know where that one came from. I also spent some time at Elsecar Parish Church searching the records for information about the Royston family. I found several references and it's just the beginning, they have a wonderful archive of Elsecar's history, thanks to the Heritage group in the village. So, we are going to the polls again. What a shocker! Well, if it's anything like last time, the only leaflet that came through our door was from the new Chinese takeaway. We didn't see anyone knocking on doors. I suppose this area is a given 'Labour' stronghold. I do find the amount of money that is wasted, not to mention productive working days, could be put to better use. I know, there are arguments on both sides. That reminds me, I forgot to tell you that I had a 'situation' last week. I shut the bedroom door from the outside, and would it open again? Not on your life. The handle had no purchase on the catch and I was well and truly locked out. Of course, it was pre-Cyrus, and all the tools were in our built in wardrobe, inside the bedroom. David was away for the night visiting our Jo and Jack in Kent, and I was left marooned on the landing. I did think, never mind I will sleep in the spare room, I had towels in the bathroom, it wasn't like I was locked out of the kitchen, heaven forbid! And then I remembered my pills on the drawers at the side of the bed. Right! Right! As luck would have it my wood carving chisels were downstairs. Oh dear, I hear you say. Next door must have thought I'd gone mad. Bang! Bang! Foot behind the door and focus of a Ninja, two minutes later I was in. The damage was minimal but we do need new handles for the door. I'm going to finish here, I hope you all had a very good Easter. 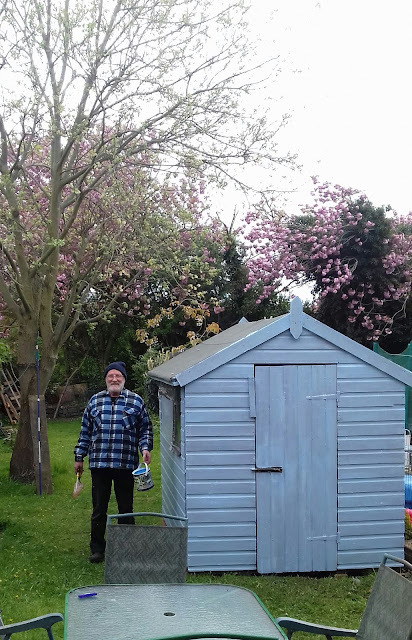 There were no eggs hidden in our garden, but we have got a most BEAUTIFUL shed. And methinks it now has a shelf if not two.